What is Latin Jazz and its origin? Latin jazz is the term given to music that combines rhythms from African and Latin American countries with Jazz and Classical harmonies from Latin America, the Caribbean, Europe and the United States. Dizzy Gillespie and Stan Kenton began to combine the rhythm section and structure of Afro-Cuban music, exemplified by Machito and His Afro-Cubans, whose musical director Mario Bauza created the first Latin jazz composition “Tanga” on May 31, 1943, with jazz instruments and solo improvisational ideas. On March 31, 1946, Stan Kenton recorded “Machito,” written by his collaborator / arranger Pete Rugolo, which is considered by many to be the first Latin jazz recording by American jazz musicians. The Kenton band was augmented by Ivan Lopez on bongos and Eugenio Reyes on maracas. 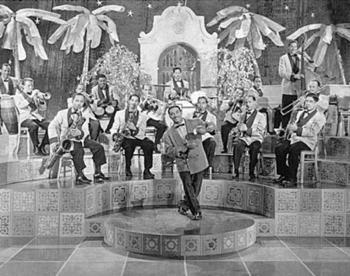 Later, on December 6th of the same year, Stan Kenton recorded an arrangement of the Afro-Cuban tune The Peanut Vendor with members of Machito’s rhythm section. In September of 1947, Dizzy Gillespie collaborated with Machito conga player Chano Pozo to perform the “Afro-Cuban Drums Suite” at Carnegie Hall. This was the first concert to feature an American band playing Afro-Cuban jazz and Pozo remained in Gillespie’s orchestra to produce “Cubana Be, Cubana Bop” among others. In comparison with traditional jazz, Latin jazz employs straight rhythm, rather than swung rhythm. Latin jazz rarely employs a backbeat, using a form of the clave instead. The conga, timbale, güiro, and claves are percussion instruments which often contribute to a “Latin” sound. Latin jazz music, like most types of jazz music, can be played in small or large groups. Small groups, or combos, often use the Be-bop format made popular in the 1950s in America, where the musicians play a standard melody, many of the musicians play an improvised solo, and then everyone plays the melody again. In Latin jazz bands, percussion often takes a center stage during a solo, and a conga or timbale can add a melodic line to any performance! Ritmo Jazz Latino Dazzles at Metro State University!